Karan Johar‘s magnum opus ‘Kalank’ was one of the most highly anticipated films of the year. The film, helmed by Abhishek Varman, boasts of a terrific ensemble cast comprising Varun Dhawan, Alia Bhatt, Aditya Roy Kapur, Sonakshi Sinha, Madhuri Dixit and Sanjay Dutt. The film has finally hit the silver screens today. There was an immense curiosity surrounding this epic drama as this is Karan Johar’s first-period drama film. ‘Kalank’, brings back the renowned jodi of Sanjay Dutt and Madhuri Dixit on the silver screen after a two decade long hiatus. Dhak Dhak girl Madhuri will be seen showcasing her terrific dancing skills in the film. We saw a glimpse of that in ‘Tabaah Ho Gaye’ song. The film’s title track crooned by Arijit Singh too forms one of the star attractions of the film. The audience has loved this love saga as they simply couldn’t stop praising it. Some complained about its almost three-hour-long run time. 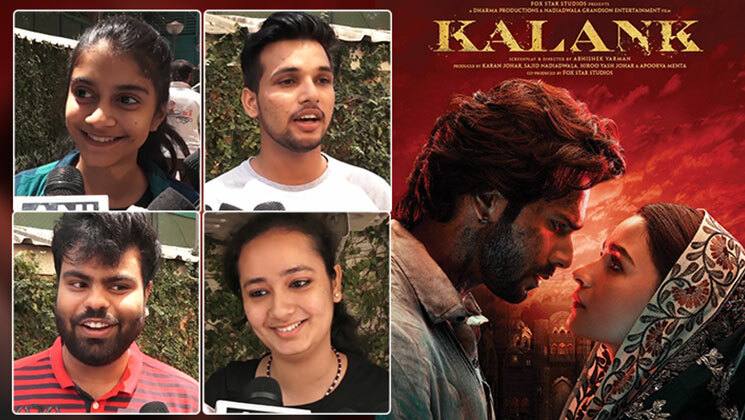 ‘Kalank’s ensemble cast, grandeur, the soundtrack has caught the audience’s attention. This Varun and Alia starrer is the widest release of 2019 so far as it has released across 4000 screens in India. Check out the following video to know the detailed public review of the film.